For Whom Or What Is The Albanian EU Delegation Celebrating? A quick scan of the Twitter feed of EU Ambassador Luigi Soreca is enough to get your yearly portion of propaganda. Any “progress” in the justice reform is celebrated by a special tweet, but as the fundamental disrespect for the rule of law that has underpinned most of the recent developments becomes ever more clear, the question becomes: for whom or what is the EU Delegation in Tirana celebrating? For the only thing to truly celebrate is a justice reform that would lead to an independent and strong judiciary, providing a check on government. This, however, has hardly been the case so far, as we have often explained on these pages. 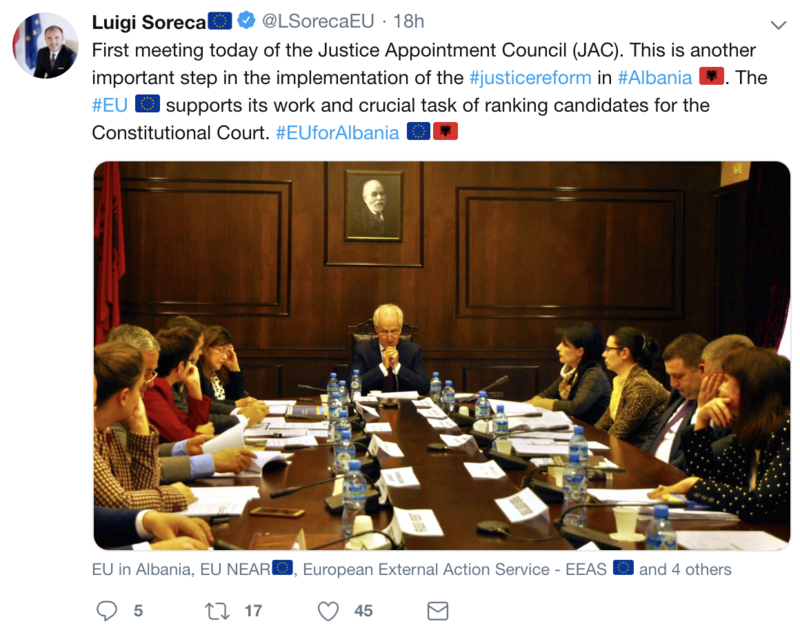 A recent tweet of Soreca is a case in point: it celebrated the first meeting of the “Temporary” Justice Appointments Council. Second, the election procedure of this particular KED has been fraught with legal violations. – The three candidates proposed by the High Court did not complete the School of Magistrates, which is a legal requirement for membership of the KED. 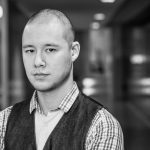 – The General Prosecution didn’t provide a full list of qualifying candidates, but made sure the current “Temporary” General Prosecutor was guaranteed as seat on the KED. – The High Council of Justice (KLD) failed to provide a list of qualifying candidates from the Courts of Appeal and Administrative on the legal deadline, which then magically turned up later without being publicly released. At this “first” meeting of the KED, it reportedly started the proceedings to rank the 40 candidates for the Constitutional Court, which currently has been reduced to a single member. These candidates have supposedly been proposed by the High Court, President, and Parliament. Only the candidate list of Parliament, consisting of 20 names, has been made public. At the same time, there are 7 candidates for the Constitutional Court which have been in the vetting process since May 15, 2018. It is unclear which institution nominated these “candidates.” One, Luan Dervishi, has been dismissed, one, Valbona Bala, has withdrawn, and one, Arta Vorpsi, has been confirmed. The other 6 are still awaiting vetting. So, at least procedurally, the election of the new 8 members of the Constitutional Court can hardly be called exemplary or transparent. So far, the website of the KED shows no announcements, no minutes, and no decisions. Not even its “first”meeting, celebrated in Soreca’s tweet, has been made public on its website. All of this, again, in violation of the law (just check art. 233 of the Governance Institutions law 115/2016). Now, finally, the KED is not even in the position to make any decision on anything until it has a quorum. 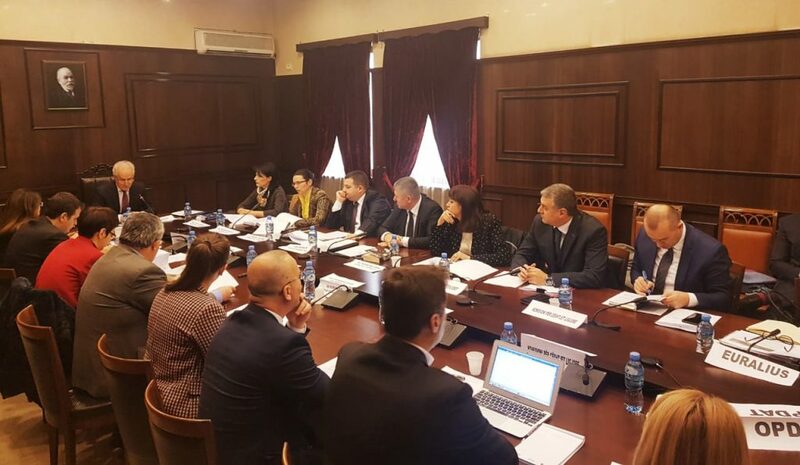 Despite the impressive group of people in the photo tweeted by Soreca, only four of the primary members actually have a legitimate vote: Vitore Tusha, Ardian Dvorani, Arta Marku, and Fatjona Memçaj. All five other candidates still need to be vetted. It would therefore have been indeed illegal had the KED taken any decisions in its first meeting. This, then, brings us back to our initial question: for whom or what is Soreca celebrating? Is he celebrating for the KED? But the KED has no quorum. Is he celebrating for the rule of law? But the law was violated numerous times to create this KED. Is he celebrating for the EU? Unlikely. As the EU is beset by ever growing nationalist forces, the last thing that would be productive is to botch the accession of a third country, without making absolutely sure that all criteria and guidelines are followed both in letter and spirit. If anything, Soreca’s premature celebrations potentially harm the cause of the EU. Is he celebrating for the government? Yes, perhaps. The government needs some good PR as it desperately grapples for “results” in the lead-up to the messianic event of the “opening of the negotiations” in May. Rama even made himself Minister for Europe to make sure that happens. Is he celebrating for himself? Most certainly. The EU Delegation in Tirana has dug such an enormous hole for itself by supporting a corrupt government in every single step of undermining key principles of the justice reform and the rule of law, that not even the greatest miracle worker would be able to tweet themself out of it. The only thing that could really restore the credibility of the EU, is if it would wholesale fire the bunch of consultancy hacks making up the EURALIUS justice assistance mission, issue a truthful progress report actually mentioning the many challenges and problems with both the legal framework and the implementation of the justice reform, and terminate its ridiculous happy-go-lucky social media presence, because it’s an insult to everyone’s intelligence. What Would Abe’s Peace Treaty With Russia Include?